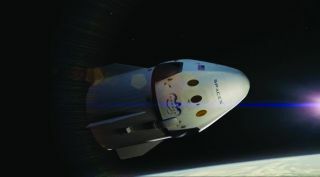 SpaceX has completed tests of its Crew Dragon spacecraft at NASA's Plum Brook Station, which the company previously said was the last step before shipping the spacecraft to Florida for launch preparations. In a speech at the American Institute of Aeronautics and Astronautics' Propulsion and Energy Forum here July 9, Janet Kavandi, director of NASA's Glenn Research Center, said the spacecraft recently left the center's Plum Brook Station after a series of thermal vacuum and acoustics tests. The company previously indicated that the testing at Plum Brook was the last milestone before the spacecraft was shipped to Florida for final testing and integration with its Falcon 9 rocket. "Once complete, Crew Dragon will travel to Kennedy Space Center in Florida ahead of its first flight," the company said in a June 20 Instagram post about the tests that were ongoing at Plum Brook. Jessica Jensen, director of Dragon mission management at SpaceX, also said the Plum Brook tests were the last before the spacecraft is shipped to Florida for launch. "Once it leaves Plum Brook, it's going to come down to Cape Canaveral for final launch processing," she said at a June 28 briefing at the Kennedy Space Center about the launch of a Dragon cargo spacecraft to the International Space Station. "We're evaluating exactly when opportunities might be and when they'll be ready, but we're not ready to set an official date at this point in time," Kirk Shireman, NASA ISS program manager, said at that June 28 briefing when asked about revised schedules for both Boeing and SpaceX commercial crew test flights. He added that updates would be coming "very soon."